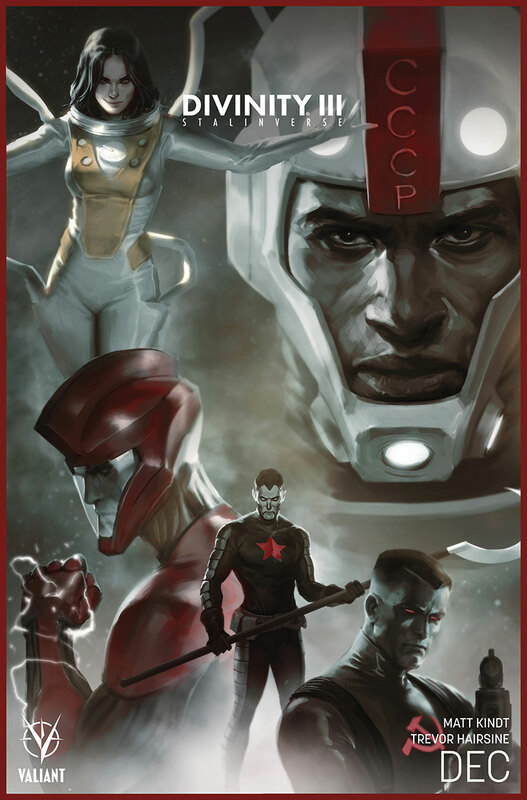 Right now Valiant Entertainment and Action Lab Entertainment are each focused on building out shared universes for their heroes to inhabit. This could have lasting positive effects on diversity in comics, much like WildStorm did back in its day. I don’t know how either publisher will fare but I’m excited that they are trying. The cultural and economic impact of Marvel and DC Comics‘s universes won’t be surpassed in our lifetimes, if ever. But could another superhero U succeed on it’s own terms? In Elle Collins’ latest column she asserts that we should look for depth not breadth in our new U’s and I’m inclined to agree. We can also use new universes as ways to bring diversity in to comics and unbridled experimentation. My colleague Sarah Rasher has some great coverage of yesterday’s Valiant Summit. What Valiant is embarking on sounds ambitious and interesting. Sarah was excited to report that Valiant is very deliberately baking in diversity as the publisher builds out its new world. I suspect that will contribute greatly towards establishing diverse characters at the core of the stories their readers will care about. The diverse characters won’t end up as tokens or “Smurfettes” as Sarah explains. Sarah and I are n00bs to Valiant but we are both intrigued by what we heard. Valiant’s new series Faith, staring a plus-size, geek-girl superhero has been a universal hit at Graphic Policy. We interviewed series writer Jody Houser on our podcast and we love her vision for the comics. What Valiant is trying to do with its Stalinverse sounds really creative even if it’s only temporary. It could end up being Valiant’s version of the Age of Apocalypse but with real world historical influences. It certainly sounds like writer Matt Kindt did his homework on Soviet history. But one ‘verse I truly loved and miss was the WildStorm Universe. Planetary offered brilliant new distillations of heroes from all genres of genre entertainment stretching back to the late 1800′s. StormWatch and The Authority gave us the gay Batman and Superman in love that we always needed (even though as Elle brilliantly asserts in her podcast about Midnighter, Midnighter is actually Wolverine, not Batman– at least as written by Steve Orlando). WildStorm gave me my fictional girlfriend Jenny Sparks– a character who has no analogue because fiction never gave us a woman like her before. The Engineer was Iron Man at its best and also at it’s most latina. I was sad when WildStorm got bought by DC because I prefer WildStorm standing as its own universe. Folded in to DC it lost a lot of what made it special. Culturally, giving a big two publisher the IP for characters like Midnighter and Apollo was incredibly significant, making it easier to bring major league gay superheroes to the forefront. But artistically, the WS characters will never be as interesting as they were in their own world. The exception of course is that Steve Orlando’s Midnighter is FAR better written as a character within his own solo series at DC then he was at WildStorm. It benefited greatly from having fresh talent like Orlando, himself a bisexual man, writing the book and the fact that it was a solo series focused on Midnighter unlike The Authority which was a team book. Orlando even found something interesting to do with Henry Bendix in the DCU, WildStorm’s particularly malicious evil mastermind. But it wasn’t DC comics that gave Midnighter room to grow by having him in a larger Universe, it was the talent on the book that gave Midnighter room to grow. One experiment we’ve seen of folding new universes in to existing ones is Milestone Media‘s relationship with DC Comics. Milestone was invented to be a black superhero universe by black talent featuring black characters. Static Shock was wildly successful, staring in his own cartoon and really being Spider-Man to a whole generation. Milestone suffered from the comics industry implosion of ’93 and retailers stereotyping it as comics only black reader would by. DC Comics needed to do more to keep this important imprint afloat. While key characters were brought in to the cartoons I’ve yet to see DC market Milestone intelligently. I was excited to hear announcements that Milestone is coming back. It will continue to be in partnership with DC and it sounds like the characters will be on their own planet, Earth M, but exist within the regular DCU. This would give them space to build their own world without being overshadowed creatively but still enable easy, audience building crossovers. However it’s been a year and a half since that news was announced and the whole project seems to still be in limbo. We need Milestone just as urgently today as we did in the 90s. I miss the WildStorm Universe being its own universe. I’m not asking to have it back, but it still felt like a loss. Parts of it are a bit of a time capsule of the 90s and 00s mores and aesthetics – these are not my preferred aesthetics but its series did feel very timely. I’m first to admit Gen-13 is kinda laughable. It was so 90s I couldn’t even stand it in the 90s! I never cared for WildCATS for similar reasons but GP founder Brett has assured me there’s a run that offered sharp commentary on corporate power. Kurt Busiek‘s Astro City universe is a pleasure to read though I haven’t kept up with the series. It featured loving and intelligent re-imagings of characters like Robin and the Fantastic Four and it continues to build out to this day. Meanwhile WildStorm served as a place of brutal satire at times. It could be nasty fun and it paved the way for beloved titles like Warren Ellis and Stuart Immonen‘s Next Wave: Agents of HATE at Marvel. In The Authority, the WSU gave Mark Millar (who I normally can’t stand) the space to point out that if a superhero team really could make a difference The Powers That Be in corporations and governments would do anything to stop them from making a difference. Because if you are in power you like things the way they are. I’ve never seen a mainstream comic make that point as clearly as Millar did in his controversial run which had the whole team killed and replaced by corporate-backed superhero stooges. Works like Planetary and the best runs of The Authority stand the test of time. I don’t think they could have happened within the Marvel or DCU. They were too experimental. They relied too much on reconfiguring existing superhero worlds to really take place with in an existing property. They weren’t afraid to challenge readers. They were both meta-human and meta-textual. Here’s to hoping places like Valiant go where the big two can’t or won’t as they build out their own superhero universes. Let’s hope they establish themselves as sites of experimentation and diversity that reflects our real world. If they do this they will have an outsized impact on the comics world no matter how many issues they sell. It will pressure the big 2 to build more diverse and inclusive worlds themselves. And it will make for some awesome reading. For Dwayne McDuffie. Robert L. Washington and all the Milestone Fans. 22 years ago this week Hardware #1 the 1st issue of Milestone Media’s comic universe hit the news stands. This month also marks Milestone Co-Creator, Writer & Editor in Chief, Dwayne McDuffie’s Birthday and the day of his transition from this world in 2011. Years back after Milestone’s first edition of books had ceased publishing, I asked Dwayne if there was something I could do for him, something animated since I had transitision from comics to motion graphics. He asked me to animate an italicized Milestone “M”. “That’s it? ?” I thought. He wanted it for his webpage and I let the idea drift away from me. This past January Oscar nominated Producer, Film Director and Comic Writer Reginald Hudlin, and original Milestone Co-Creator, Creative Director Denys Cowan and President, Derek T. Dingle announced Milestone will return with a live action Static episodic show and more details that will be announced this summer. The entire piece is designed and animated by me of course. Took about a week from concept to final. Its the least I could do in honor of Dwayne and, it seemed like the perfect time for me to Celebrate Milestone 2.0, Dwayne’s Birthday and deliver on his simple ask. Our Black History Month coverage continues! Milestone Media is a publisher everyone should know, and you probably know their creations. Formed in 1993, Milestone Media was created by a coalition of African-America creators, Dwayne McDuffie, Denys Cowan, Michael Davis, and Derek T. Dingle. The company’s focus was to create a new generation of characters stepping in to fill the void that was the lack of diversity in American comics. Through a partnership with DC Comics, the publisher created memorable series and characters like Hardware, Blood Syndicate, Icon, Static (aka Static Shock), Shadow Cabinet, Xombi, Kobalt, and Heroes. The deal wasn’t without controversy, as some saw the deal as a compromise of the founding of the company, to be an independent black comic publisher. The characters were so important DC has attempted (with mixed success) to incorporate the characters into the DC Universe proper, with the most notable being Static who had his own series, and joined the Teen Titans. With all of that triumph, Milestone suffered tragedy as well, when creator Dwayne McDuffie passed away almost four years ago at the age of 49 at the peak of his career. Four years later, and it looks like Milestone Media will rise from that tragedy as Reggie Huddlin (the producer of Django Unchained) along with Cowan and Dingle will revive the publisher for a new generation to discover. The plan is to bring back many of the classic character as well as introduce new ones. It’s unclear how this might work, considering DC Comics and Warner Bros. are working on a live-action Static Shock series. But sorting all of the business out, as well as building new partnerships is what’s being worked on. The goal isn’t just to bring back their classic characters, and create new ones, but also develop new talent. There isn’t a launch date, but there will be some more shown during this year’s San Diego Comic-Con. Formed in 1993, Milestone Media was created by a coalition of African-America creators, Dwayne McDuffie, Denys Cowan, Michael Davis, and Derek T. Dingle. The company’s focus was to create a new generation of characters stepping in to fill the void that was the lack of diversity in American comics. Through a partnership with DC Comics, the publisher created memeorable series and characters like Hardware, Blood Syndicate, Icon, Static (aka Static Shock), Shadow Cabinet, Xombi, Kobalt, and Heroes. The characters were so important DC has attempted (with mixed success) to incorporate the characters into the DC Universe proper, with the most notable being Static who had his own series, and joined the Teen Titans. Four years later, and it looks like Milestone Media will rise from that tragedy as Reggie Huddlin (the producer of Django Unchained) along with Cowan and Dingle will revive the publisher for a new generation to discover. As reported by Comics Riff, the discussion began in 2011 at a gathering to remember McDuffie. Diversity has been on the mind of comic publishers. Marvel introduced Miles Morales, a half-black/half-Puerto Rican, as Spider-Man in their Ultimate Universe, and Sam Wilson aka the Falcon has taken over the mantle of Captain America. DC has pushed the John Stewart Green Lantern, introduced Batwing in their New 52 relaunch, and a new black Power Girl. Thor, Archie’s the Shield, and Dynamite’s Solar have all been gender switched. Cowan points out though that putting a character in a previously white mantle isn’t the same as creating whole new heroes. Cowan said their characters aren’t just black versions of existing legacy characters, they come from a specific view.